The dado panel from the Courtyard of the Royal Palace of Mas’ud III is a fine example of the artistic preferences of the Ghaznavid dynasty, which ruled the Indian subcontinent from 977 to 1186 C.E. A dado panel is a two to three foot lower part of a wall, typically decorated in a variety of media. This dado panel formed part of a larger dado, found within the courtyard of the Palace of Mas’ud III, just south of Kabul, Afghanistan, and it is currently located in the Brooklyn Museum’s Arts of the Islamic World collection. Although the panel was not found in-situ, it closely resembles other panels found within the palace’s courtyard. The panel can be broken up into three registers (below left). 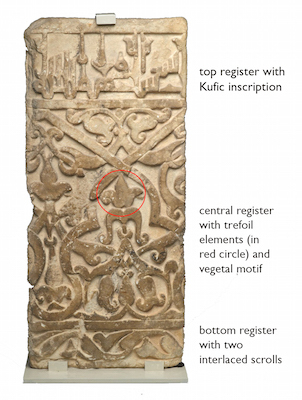 The top register contains a Kufic inscription, which would have been part of a continuous inscription that encircled the entire courtyard across the tops of multiple adjacent panels. Kufic script is a style of writing Arabic popular from the seventh century C.E. 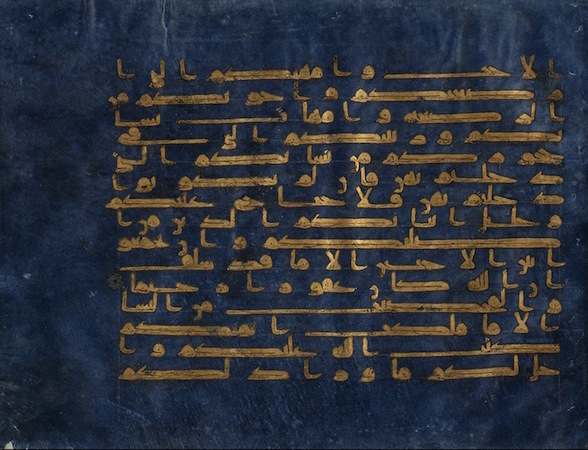 until the late tenth century C.E., as seen in the page from the Qur’an above. The central register of the dado panel is a large sequence of trefoil (tri-lobed leaf) elements with a vegetal motif, and the bottom register consists of two scrolls interlaced with each other. The panel would have been painted blue and red as well as gilded. It shows signs of wear, with markings and discoloration, most likely from exposure to various elements over time. The Ghaznavids were of Turkish origin, and they preferred a fusion of Iranian and Arab stylistic influences, along with a strong interest in Persian art and poetry. Their capital, Ghazni lied on an important trade route, resulting in influences from around the region. The Palace of Mas’ud III provides the best evidence for the social, cultural and artistic nature of the Ghaznavid Dynasty. The construction date is unknown but it was completed towards the end of the dynasty. It was built of a combination of baked and unbaked brick with pressed clay. It sits on a quadrangular plan organized around a central courtyard with four iwans. The two excavations that were carried out between 1957 and 1966 produced a number of finds, including a long dado frieze in the courtyard. About forty-four panels were found in-situ and about four hundred dado fragments were also recovered. It is believed that there were about five hundred panels in all. They are made of marble, which came from a marble quarry found near Ghazni. The Ghaznavids used a large amount of marble throughout the city, during a time where brick and stucco were favored for décor purposes. The influence of the city of Baghdad, which was also built up heavily with marble by the Abbasids possibly explains the popularity of the medium at this time. 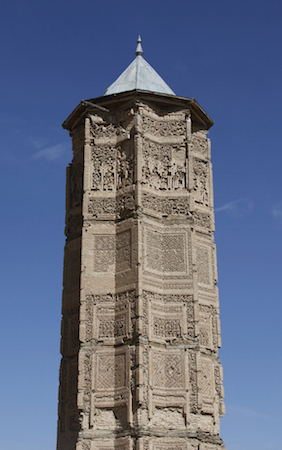 Ghazni has only recently attracted scholars with the discovery of a great-stylized minaret, also dating to Mas’ud III’s reign (above). Dado Panel with inscription in upper left corner, 10th century, Iran, stucco; carved, with some cast plaster elements, 68 5/8 x 92 3/4″ (The Metropolitan Museum of Art)Although the Kufic inscription on this panel has not been translated, translations of other sections of the frieze contain a Persian poem that praised the Ghaznavid rulers. There is no author or written text to accompany the work, but scholars believe that the poet was someone associated with court life who probably wrote the poem for this specific purpose. This particular inscription, from the twelfth century, is one of the oldest uses of Persian in place of Arabic. It is likely that the inscription was commissioned in conjunction with the completion of the building, a practice that is also seen in Sicily and Alhambra. In Persia, it was common practice to adorn sacred and secular buildings with inscriptions (see the example from Iran, above). 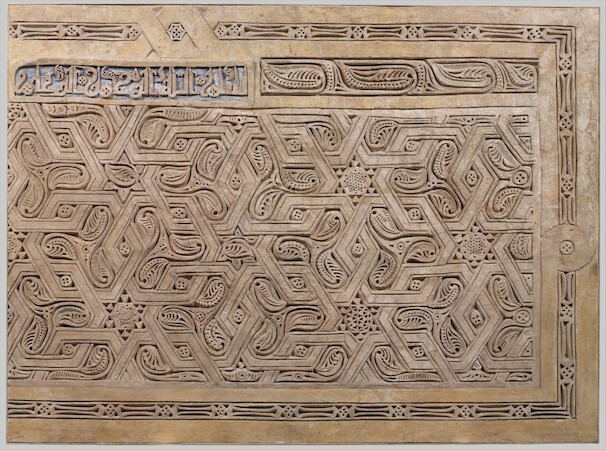 The dado panel from the Brooklyn Museum is part of a much larger work of art and a representation of the very essence of the Ghaznavid Dynasty. It is evident that the Ghazavids were deviating from the artistic and architectural norms of the time with the construction of the palace dado frieze. 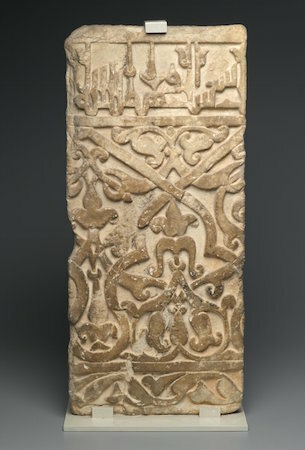 Not only did they follow the Abbasids’ use of marble for decorative purposes, but they also used Persian within the dado inscription, which was unique at the time. The use of the inscription on the dado as a commemorative display to honor the leaders of the dynasty and mark the construction of the building was also unusual. The use of Persian terms in place of Arab letters might have been a result of their expanding empire, of the dynasty’s influential origins, or of an appreciation for Persian literature. The dado panel at the Brooklyn Museum is a rare work of art from a period of creative nonconformity, and it is representative of the Ghaznavids’ signature artistic style. Alessio Bombaci, The Kufic Inscription in Persian Verses in the Court of the Royal Palace of Mas’ud III at Ghazni (Rome: Insituto Italiano per Medio ed Estremo Oriente, 1966). —- “Summary Report on the Italian Archaeological Mission in Afghanistan. Introduction to the Excavations at Ghazni,” East and West, Vol. 10, No. 1 / 2 (March-June 1959), pp. 3-22. C. E. Bosworth, “The Ghaznavids,” UNESCO History of Civilizations of Central Asia, Vol. IVa, 2014. Roberta Giunta, “Islamic Ghazni An IsIAO Archaeological Project in Afghanistan: A Preliminary Report (July 2004-June 2005),” East and West, Vol. 55, No. 1 / 4 (December 2005), pp. 473-484. Cite this page as: Elizabeth Kurtulik Mercuri, "Dado Panel, Courtyard of the Royal Palace of Mas’ud III," in Smarthistory, January 26, 2018, accessed April 20, 2019, https://smarthistory.org/dado-panel-courtyard-of-the-royal-palace-of-masud-iii-2/.